The Kensington Apts Econotels are only 100 metres from the centre of this popular resort, and within 50 metres of Bananas night club and Bar Poco Loco. 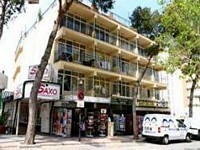 These apartments are well placed for a lively holiday and offer great value for money. The golden sandy beach of Playa de Son Matias is just 100 metres away and offers great water sports; sailing, windsurfing and waterskiing all readily available. The apartments are spacious, very bright and comfortable with direct access onto a terrace. For a lively holiday in the Spanish sunshine which is kind to your budget, book into the Kensington Apts Econotel and enjoy! Getting to the hotel: Palma de Malorca Airport is 28 km from the Kensington Apartments Econotels. Local tips: Opposite the Kensington are a supermarket and a bank, plenty of local snack bars and tapas restaurants. The lovely city of Palma is only 20 minutes by ca and a regular bus service operates every half an hour.